I stumbled across graze.com a year ago and I was intrigued at what they were selling. 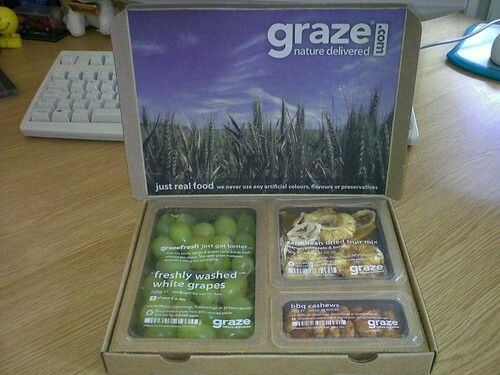 Graze is basically healthy eating by post. They have a selection of foods from nuts to fruit and seeds to olives. They offer quality food delivered to your door on a regular basis. You can choose what goes in your box from over 100 different choices. You can rate the products they have so they never send you things you don't like. The food is well packaged and environmentally friendly. They continually add new lines to their range to keep it exciting. These boxes are a good lunch substitute and a boost to my healthy eating. I'm still impressed a year on. Having just tucked into my 42nd box of goodness from Graze.com, I went on to their website to rate the selection they sent me. Whilst there I noticed a promotional code so that anyone can get their first box free. I hope you like them guys. The key to a scrummy box is rating the selections. I've taken the plunge, thanks for the freebie Toby. Balti flavoured Brazil Nuts. The food of champions! Glad you're enjoying it so far. I sometimes get a duff one but it's only because I thought I might like it! My favourite is the fresh pineapple and the flavoured nuts.